general debility .Treat your dog regularly with a veterinary product such as frontline every 3 months (every 2 months if a drop on product is used). animals – a flea caught in the comb will be killed by running your thumbnail firmly across the teeth. Spray and all bedding washed. NB You can choose a homeopathic approach or rely on meticulous grooming. These are more rare but can be picked up from grass or other animals. Usually found when you are stroking your dog. It will look like a grey sac attached to your dogs’ skin. 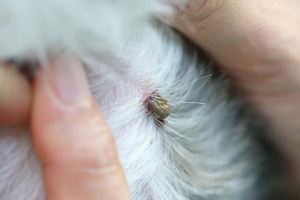 DO NOT PULL IT OFF.This can leave the head in the skin (as ticks have very strong jaws) and can lead to severe infection. If you dog has frontlined the tick will die within 24 hours or they can be ‘stunned’ with surgical spirits/ meths/ ,then held firmly by tweezers just below the mouth then sharply jerked off. Treat the area with an antiseptic cream. A lit cigarette held against the 'end' of the tick will also work if you have a steady hand. 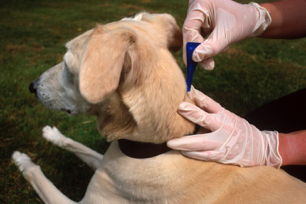 Your dog should be wormed every 3 months just after flea treatment. Use Drontal Plus or similar from the VET. Round worm eggs are picked by your dog sniffing faeces left by other dogs Or the ground where faeces have been. In rare cases they can cause eye disease or blindness in children. Always ensure children follow hygiene routine ie. hand washing after playing with the dog. Tape Worms are part of the lifecycle of the flea or found in uncooked meat. Worm Infestation can cause general ill health, poor coat and bad breath and can have even more serious effects in a weak or ill elderly dog or puppy. 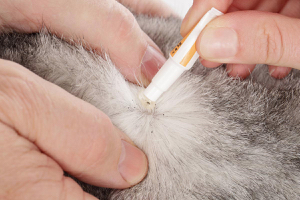 WORMING SHOULD BE CARRIED OUT 4 TIMES PER YEAR IN CONJUNCTION WITH FLEA TREATMENT. A dry, flaky skin should improve with sufficient oil in the diet – from sardines etc in oil. Sometimes moving into a centrally heated home in the winter can change the skin condition at the start. Use COCONUT OIL (a small amount rubbed into the hands first) can be massaged in well. This can be done weekly if needed. BENZYL BENZOATE (purchased from a chemist) can be used once a month – small amount massage in and left for a day before grooming. This removes dry flaky skin. Persistent sore red patches with hair loss, irritation or thickening scaly skin will indicate MANGE and needs immediate visit to vet. Massaging encourages hair regrowth on bald patches, which can also be helped by soft bedding and a relaxing life. ‘Old Wives Tale’ from me: sometimes tinned tomatoes added to dinner encourages hair growth and can also prevent ‘grass burning’ by urine. Aloe Vera	Great for minor scratches, sore areas etc. Bathing, resist the urge to constantly bath unless your dog has rolled in the first spring cow pat. At most once a year in Spring using dog shampoo and rinse and dry well. A heavy moult can be helped by a bath. Do before Flea Treatment. 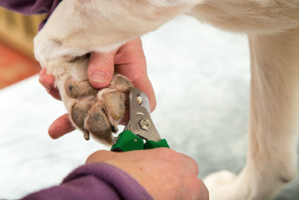 Always check for small injuries – limping, swelling or licking the foot will alert you. Small cuts and grazes can be washed with salt water and treated with ALOE VERA or ZINC AND CASTOR OIL (or similar). Look out for foreign bodies – Thorns or grit. Remove with tweezers, wash in salt water and treat as cuts. Persistent swelling will need a trip to the vets. Dirt trapped at the base of the nail can be cleaned out with an old toothbrush. Sore pads can develop when your dog is walking on hard, drying surfaces such as Tarmac.Pads can be hardened up using surgical spirit. Aloe Vera is excellent for soreness, dry or cracked pads and won’t damage carpets or soft furnishings. Too long and walking becomes uncomfortable and balance is difficult. Road walking can help to keep them short but all nails grow at different rates. You should not be able to hear the nails tapping on the road and should be able to slide a piece of paper under the nail – the pads support the feet. Cut regularly with secateur type cutters. Make a straight cut below the quick (the red blood vessel in the nail). Cutting a little each week avoids catching the quick which will recede with each cut. Greyhounds are used to nail cutting. Clean weekly with all the other grooming jobs. Use cotton wool or buds to gently clean outer ear. A veterinary product such as DERMISOL can be used for very dirty ears to soften and free dirt and wax. 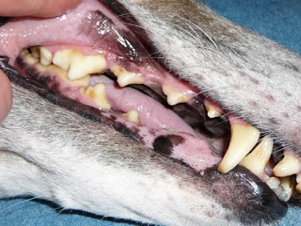 Your greyhound will have had a full dental check prior to homing. Regular brushing with a specialist toothpaste – we recommend an ENZYMATIC DENTAL GEL (from the vets) and a weekly dry roasted bone and occasional dental chews/pigs ears etc. should keep them clean. Always check when you are grooming – bleeding gums or severe patches of tartar you can’t clean off need attention.